Both Dr. Chase and Dr. Gunn provided a simple and effective home remedy to kill ants. In the old days, keeping your home clean and free from pests was as essential to health as keeping the right ingredients for many folk recipes in your medicine chest. Go to a gardening or landscaping center and buy diatomaceous earth. This is a special earth that, when viewed under a microscope, is seen to have very sharp jagged edges around each particle. If an ant tries to walk through it, their legs will be cut immediately. They hate this earth! Sprinkle a thin line of it around areas where ants are gaining access to your home: underneath window sills, doors, and cabinets. It is a great home remedy to kill ants or at least, keep them out of your home! You can also use white chalk powder as above. Saturate cotton balls with Oil of Peppermint and place them in areas where ants are found. Ants hate the scent of peppermint and will vacate. As a matter of fact, so do spiders, so you can get rid of two "pests" with one stone using this remedy! Saturate cotton balls with Oil of Pennyroyal and place in ant-infested areas, as above. If you don't like the idea of using cotton balls, you can make a mixture of Peppermint or Pennyroyal oil with water and use a spray bottle to mist the ant-infested areas. Better yet, use a pair of old socks instead of cotton balls. They will retain the scent for a long time and they can be used over and over again. Learn more about Peppermint Essential Oil here. 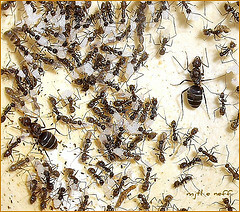 For more pest control remedies visit Pest-Exterminators.com.